Don’t be late for this very important date and join us at our JWC Wonderland! 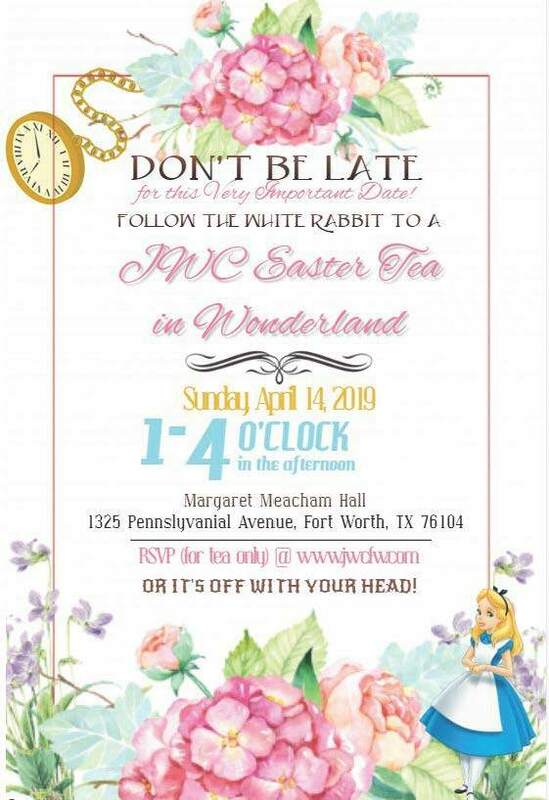 Bring your family to enjoy afternoon tea, an Easter egg hunt for children of different age groups, Alice in Wonderland Characters, photos with the Easter bunny, arts and crafts, music, bunnies, a tortoise or two, and much more. The event and all activities are free to the public, except the afternoon tea. Please only register if you wish to participate in the afternoon tea. There will be two time slots for afternoon tea. The first seating is from 2:00-2:30, and the second is from 3:00-3:30. Registration for a time slot is $5 per person. Once paid, please email lizzieyz@hotmail.com for desired time slot.